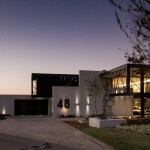 Nico van der Meulen Architects have designed the Serengeti house in Johannesburg, South Africa. 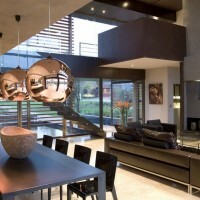 This Johannesburg home, located on a suburban golf estate, is happy in Africa, as well as with its place in the global design village. The home’s visual success is due to its perfectly balanced application of earthy textures against high-gloss finishes, and raw material against refined elements. 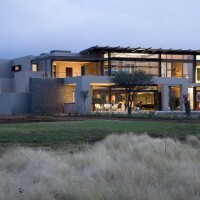 “The Brief”, says Rudolph van der Meulen of Nico van der Meulen Architects,, “was to create a stylish family home with ecologically sound design that maximized indoor-outdoor living to take full advantage of Johannesburg’s legendary eight-month summer”. Says van der Meulen, “It’s a double-storey home with an open-plan living area downstairs, an upstairs pyjama lounge, a study, and four bedrooms, all of them en-suite. 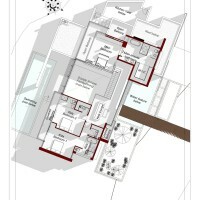 The three family bedrooms are upstairs, and we positioned the guest room downstairs, separating it from the family’s sleeping area to maximize privacy”. The home combines the use of rock, steel, wood and glass – classic modernist design elements re-mixed for new applications. The front of the home features a rusted-steel-clad wall, cleverly mounted on tracks so that it slides back to reveal the garage. 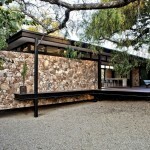 Visual continuity is provided through the use of rusted-steel finishing on the entrance and upper-level window frames. 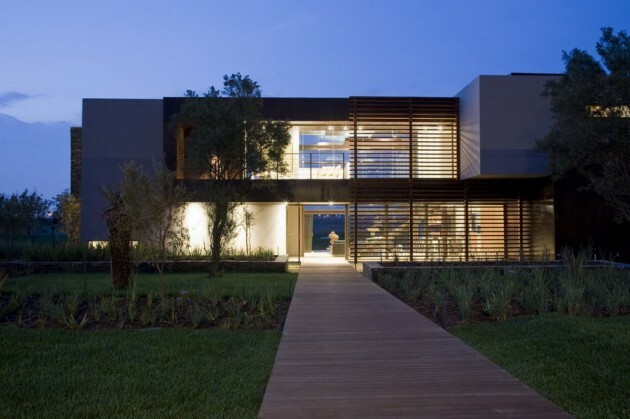 Wood is used on the home’s walkway and its bathroom flooring. 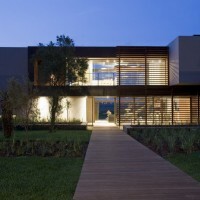 “There is a Balau wooden walkway from the street to the front door, which carries you over a Koi pond that fronts the house, and the master bathroom also has Balau wooden-floor decking”, says van der Meulen, “so when you slide back the glass doors onto the terrace, it visually creates one unified space. It’s also very easy to keep clean. We’ve avoided the use of tiles in the bathrooms, opting instead for back-sprayed glass. For the kids’ room, we’ve used lime green to add some visual punch”. Visual lift is also provided through the use of sculptures by van der Meulen’s brother, Regardt, and artist Ronel Jordaan’s world-famous Merino-wool felt pebbles. It’s little visual treats such as these that inform the home’s many X-factors, lifting it above the mundane. Every turn of a corner provides the eye with a discreet visual delight that’s almost Japanese in its subtlety, from the use of raked plaster in a wall application and the hidden-access pantry in the kitchen to the fireplace surround clad in granite panels and the pyjama lounge’s floating ceilings. The home’s lower level interacts with the back garden’s pool and dining terrace through the use of floor-to-ceiling slide-back glass walls that create a seamless interactive space. A kitchen window-hatch opens onto the barbeque area, providing an almost modern twist on the old-school roadhouse. 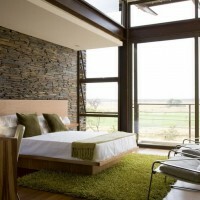 “It’s an ecologically smart home”, says van der Meulen, “with a two-foot-thick, stone-clad western wall serving as a heat absorber while providing visual kick. Likewise, the home’s windows are recessed, with overhangs that are strategically cantilevered to catch the sun during the winter months, while blocking it in the summer. 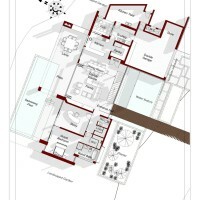 Similarly, the home has sun-control fins to cut out the summer sun. The roof is insulated Chromadek and timber, which also provide insulation”. 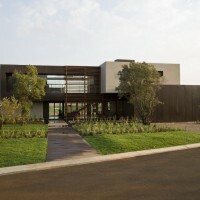 When viewed from the street, the home’s central core is transparent, book-ended by imposing solid shapes on either side; you can look right through it onto the vlei and the golf course beyond its back garden. 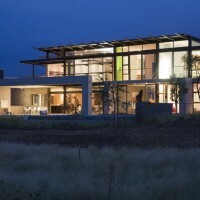 Ultimately, the home’s environment informs its location – not its design or decor. Above all, it provides a subtle sense of understated glamour through its visual accents, successfully combining with the hassle-free maintenance of its durable building materials and maximized indoor-outdoor living application – a winning trilogy that’s perfect for modern living. 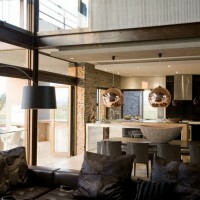 Visit the Nico van der Meulen Architects website – here.